Longhorns’ junior Jayden Lacey, #15, battles to the hoop. Longhorns pictured are freshmen Casey Johnson, #13, and junior Coltin Peterson, #4, in Tampa Bay Tech loss last Friday. Not the movie. 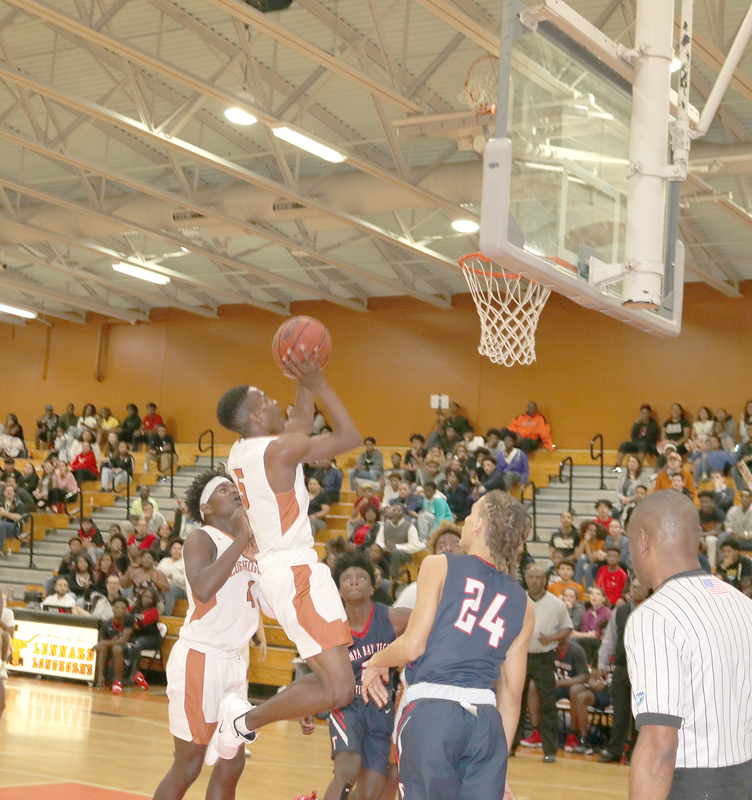 But the basketball game between Lennard and Tampa Bay Tech (TBT) last Friday, Jan. 18. Tampa Bay Tech came out on fire. The Techsters went up and down the hardwood of the Lennard gym in front of the largest crowd of the season, never taking their foot off the gas pedal. When it was all over, Coach Adrian Johnson’s Titans casually went back to Tampa with a resounding District 9 85-62 victory in their possession. The defeat left Lennard at 11-7 overall and 4-5 in District 9. Tampa Bay Tech remains in first place, ahead of Plant City and Strawberry Crest, with the Longhorns in fourth place in district. Lennard Longhorns Assistant Basketball Coach Courtney Ruffin in his first year at Lennard. According to head coach Stojakovic, Ruffin contributes a great deal to the team with his knowledge of the game, and he works well with the squad. Ruffin worked previously as an assistant at East Bay and at the Bolles School in Jacksonville. Coach Zarko Stojakovich’s team had games after press time this week at Crystal River in a Martin Luther King Jr. Day game, and then Lennard turned around the next day to face the East Bay Indians at their place. Other Lennard games this week in Ruskin include Jan. 24 with Durant and Jan. 25 against Bloomingdale. Road games follow against Leto Jan. 29 and Freedom Feb. 5. Lennard’s final regular season game is at home versus Blake on Feb. 8. The games with East Bay, Durant here, and Bloomingdale here are all District 9 games against teams below Lennard in district standings, and all three teams that Lennard has already beaten this season. The Longhorns kept up with TBT’s torrid onslaught at the outset of the Jan. 18 game, but finally succumbed to superior size and athleticism. Lennard tried to play to TBT’s up-tempo, but could not. Neither could Lennard slow the pace down. “Our keys were to rebound and to not allow TBT to get out and run in transition,” commented Stojakovich after the game. “We struggled on all of our keys. Looking for the net is Longhorn senior Rae’Shaun Wilson, #5, in Longhorns second loss to Tampa Bay Tech this season. “If we see them again (in the play-offs) we will focus on playing at a much slower pace that fits our kids. “We are still rebuilding our team!” said the Longhorns coach. Leading scorers for the Longhorns in the TBT game were: Jayden Lacey 17, CJ Peterson 14, Rae’Shaun Wilson 14 and Casey Johnson 6. 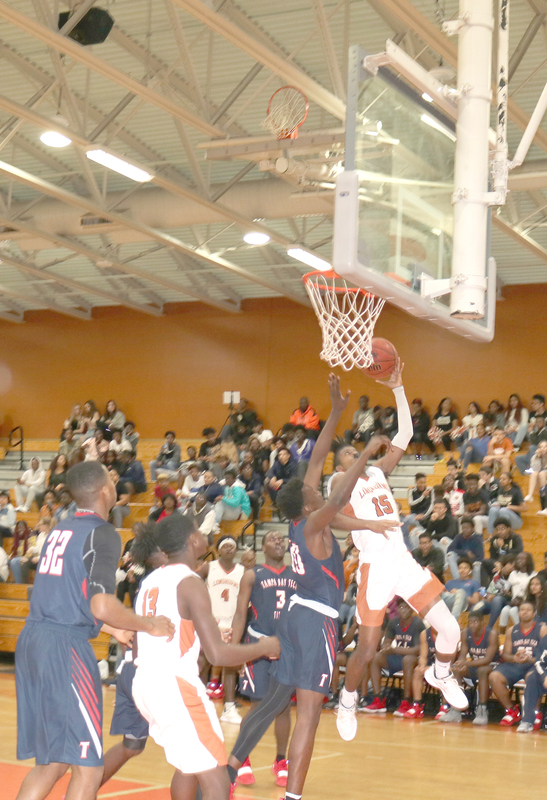 Previous to the Tampa Bay Tech (TBT) game, on Jan. 18, coach Zerko Stojakovich’s Longhorns pulled off a major upset by knocking off Plant City 58-53 on the road. Plant City has been atop the 8A District 9 standings all season long, ahead of TBT, Strawberry Crest and Lennard. “We are now on the bubble of being in the top 15 teams in the area,” said Stojakovich gleefully after the Plant City win. The night before, Lennard was swamped 76-55 in Dover by Strawberry Crest, as the Chargers continued their winning ways in District 9.